Drilling Fluids, such as Super Mud (dry or liquid) are designed to aide in the efficiency of drilling holes in particular types of materials, such as soft or sandy ground. Specialized drilling fluid additives have become quite technologically superior since they were first introduced to the drilling environment in the 1920's and 30's. There is a long list of reasons why utilizing drilling fluids will help with your drilling needs, including the support and stabilization of the drilled walls, aiding in the cooling and lubricating of the auger or drilling bucket and the bits or teeth. In many situations most of the drilling fluid can be saved and used for other holes, becoming more cost efficient. 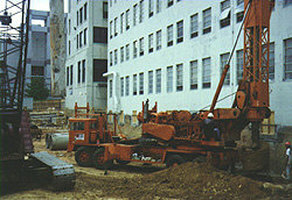 ​bentonites with technical assistance and site specific programs available for your drilling project. Super Mud - a liquid emulsion polyacrylamide polymer viscosifier. Super Mud Dry - a granular polyacrylamide polymer viscosifier. Super Mud Custom Blend - a granular polyacrylamide polymer viscosifier modified with a mineral blend. Spectrum - High Shear viscosifier. Quik Floc - a liquid polyacrylamide polymer flocculent. Soilsorb - a branched chain polyacrylamide, negatively charged and high molecular weight, super absorbant. Aquasorb - a branch chained polyacrylamide blended for easy mixing. Water Treat - pH conditioner for slurry make up water. Marsh Funnel and Viscosity Cup - gives an accurate measure of the drilling fluid viscosity. pH Test Papers - used to determine the pH level of the drilling fluid. Standard Scale - A full-size mud scale used to determine the weight of the drilling fluid. 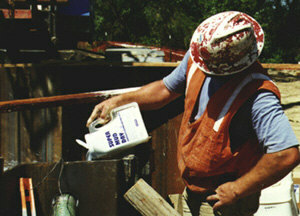 Mini Scale - A handy, pocket-size, low cost scale measures the weight of the drilling fluid. Sand Content Kit - This kit measures the percentage of sand (by volume) suspended within ​the drilling fluid. Fluid Sampler - PVC bailer with double ball check valves for obtaining slurry samples at any depth of the excavation. Site-specific slurry system programs - A slurry program designed for your project, detailing everything from mixing to disposal. 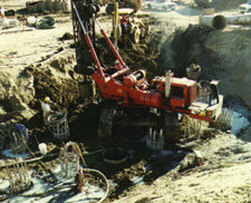 Slurry cost estimation - An estimate of the amount of slurry materials needed to complete the project. On-site technical management - PDSCo's staff qualified technicians for on-site training and technical management. Super Mud - an environmentally safe drilling slurry. Supra Foam - a premium drilling foamer that can be used as drilling or as part of the Super Air Drilling System. When used in conjunction with Super Mud, this system permits the drilling of larger diameter, deeper holes with less air than ever before. Field Grade Foam - an excellent foamer for air drilling. Can be used in a mist or injection system. Biodegradable and medium priced. High Yield Bentonite Gel - a polymer extended sodium bentonite which has been molded specifically for water well drilling. Use when a minimum 200 barrel yield mud is required. Natural Bentonite Gel - pure, unaltered sodium bentonite, produced from high quality Wyoming Bentonite. Yields 90 bbl minimum. PDSCo Gel - a low cost, polymer extended sodium bentonite which yields a 90 bbl minimum. Polyore - a natural food grade/ organic polymer in powder form which is ideal in areas with low soil pH. Pel Plug - highly compressed sodium bentonite pellets. Available in 1/4", 3/8", and 1/2" sizes. Pel Plug TR30 - highly compressed sodium bentonite pellets with a biodegradable non-stick coating. The TR30 coating allows the pellets to be poured through standing water without sticking together for approximately 30 minutes, thus allowing for deeper setting. Granular Seal - a granular bentonite that contains no additives. It provides an economical way of bentonite grouting, and can be poured dry or used as an easily mixed grout for tremmie placement. PDSCo Plug - high swelling chemically unaltered bentonite chips for use in hole abandonment, sealing casing, plugging flow holes, and isolation aquafiers. Available in 3/8" or 3/4" chips. 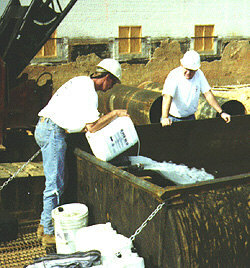 PDSCo Grout - a modified bentonite designed to be mixed with water and pumped to its destination. It can be used as water well grouting fluid, as a drill hole abandonment fluid or for sealing around monitoring well casings. Miscellaneous: PVC Well Screens, Well Protectors (square or round), Bailers, Mini-Mixer, Fluid Sampler, Marsh Funnel, Viscosity Cup, pH papers, Water Treat (pH conditioner), PDS Wetting Agent (detergent).